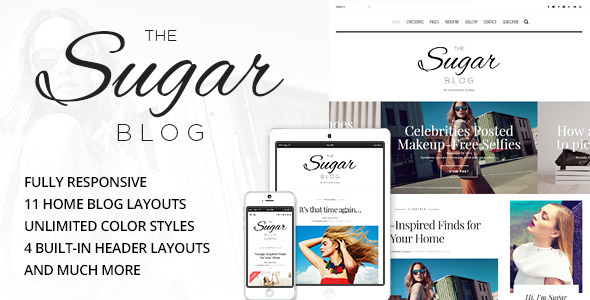 SugarBlog is a simple, clean, personal, modern and professional blog ideal for spreading stories. It’s totally responsive so it adapts to your style as well as the device it’s viewed on. It’s loaded with great features: unlimited styles support, header styler, 3 built-in header layouts, widget manager, 9 custom page templates, built in categorized image gallery with 2, 3, 4, 5 columns and integrated lightbox, 10 custom widgets, features 9 post formats: Standard, Aside, Gallery Slideshow, Gallery Grid, Link, Image, Quote, Audio, Video, powerful theme options panel, built in SUBSCRIBE page and LOGIN page, full width INSTAGRAM, compatible with WooCommerce 2.x and more. If you like SugarBlog, please don’t forget to rate it!! With the Widget Manager, you can now decide on which page you want to see the widget or not. Added compatibility with Gutenberg editor. Added support for microformats. Fixed tooltips.